Objective: The objective of this study was to determine the knowledge, attitude, and practical behavior of parents regarding their children's oral health in New Delhi. Methodology: A cross-sectional study was conducted among 500 parents who reported in outpatient department in the Department of General Medicine at Maulana Azad Medical College and in the Department of Pedodontics and Preventive Dentistry at Maulana Azad Institute of Dental Sciences, New Delhi. Data were collected through a self-administered questionnaire. The statistical analysis was performed using the Statistical Package for Social Sciences software (21.0 version; Inc., Chicago IL, USA) for descriptive and multivariate analysis, and the level of statistical significance used in this study was chosen at P < 0.005. Results: The results of this explorative research showed that the sample selected had a relatively good knowledge regarding the importance of the primary teeth, the fact that problems in primary teeth can affect the permanent teeth, brushing frequency on daily basis, and brushing aids. Participants were aware about the effect of prolonged bottle feeding and sticky foods on the dentition. On the other hand, the majority of participants failed to recognize the ideal time of first dental visit. Parents showed positive attitudes regarding the importance of regular dental visit and their role in their children's daily oral hygiene habits. Conclusion: In New Delhi, parental awareness and attitudes regarding their children's oral health are relatively good. 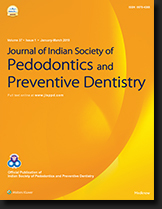 However, the high dental caries prevalence in children in Central New Delhi contradict the study findings, which prove the fact that changing parental behavior and attitudes toward their children's oral health is far more important than increasing their knowledge only. Aim: The aim of this study was to assess the prevalence of pacifier use among Saudi children and analyze the effects of maternal education and dental visits on the age of pacifier withdrawal. Methods: The dental histories of mothers of 300 children with age group of 2–7 years were obtained along with their educational level, frequency of dental checkups, and age of pacifier withdrawal. Data were analyzed using the cross-tabulation and Chi-square tests. Results: Forty percent (n = 133) of the children used pacifier. There was an effect of maternal education on the age of pacifier withdrawal: higher the maternal education, younger the age of pacifier withdrawal. The frequency of dental visits influenced the relationship between maternal education and age of pacifier withdrawal. Conclusions: Unhealthy oral habits such as prolonged pacifier use can be reduced with regular dental checkups and higher levels of mother education. Hence, we recommend that children should start dental visits at an early age and maintain visits at regular intervals. Context: The relationship between body mass index (BMI) and dental caries consists of multiple contributing factors. There have been no studies documented in the literature in this part of rural India assessing the prevalence of dental caries in relation to BMI. Hence, an attempt was made to study dental caries in relation to BMI and anthropometric measurements. Aims: The aims were to study dental caries experience in relation to BMI and anthropometric measurements of rural children in Nellore district. Settings and Design: A descriptive cross-sectional study was carried out in Nellore city. Subjects and Methods: A total of 1500 6- and 12-year-old children were examined. Dental caries was examined using the WHO dentition status criteria (1997) and 1-day diet chart was collected from each child followed by collection of anthropometric data. Statistical Analysis Used: Statistical analysis was performed using Chi-square test, Fisher's exact test, and Spearman's correlation test. Results: In the present study, out of all the participants, 59.2% of low weight children, 41.3% of normal weight children, and 25.7% of overweight-obese children were having dental caries. Dental caries was more among low weight children compared to normal weight and overweight-obese children and was statistically significant. Conclusions: All the anthropometric measurements were positively correlated with dental caries except height for age and BMI for age. There was an inverse graded association between the height for age and BMI for age with dental caries in 6- and 12-year-old children. Background: Finger sucking and prolonged dummy sucking are the most prevalent oral habits among infants, toddlers, and children. Pediatricians are more likely to see infants and children much earlier than dentists. Thus, it is essential for these specialists to be aware of the harmful nature of digit sucking habit and its associated complications. Aims and Objectives: The present study was designed to evaluate the knowledge and attitude among pediatricians about digit sucking habit in children. Methodology: The survey was carried out using a self-administered questionnaire which was delivered to the study subjects by hand or by mail. The returned questionnaires from the pediatricians were statistically analyzed using descriptive statistics (percentage). Results: This study showed that many respondents were unaware that oral habits could be responsible for malocclusion. A high percentage of respondents preferred not to examine oral features in digit sucking child. Among the etiological factor that may contribute to digit sucking habit in a child, most of the respondents expressed that habitual, psychological and inadequate parental care are possible causes. Most of the participants answered that parental and child counseling is essential to stop the habit. 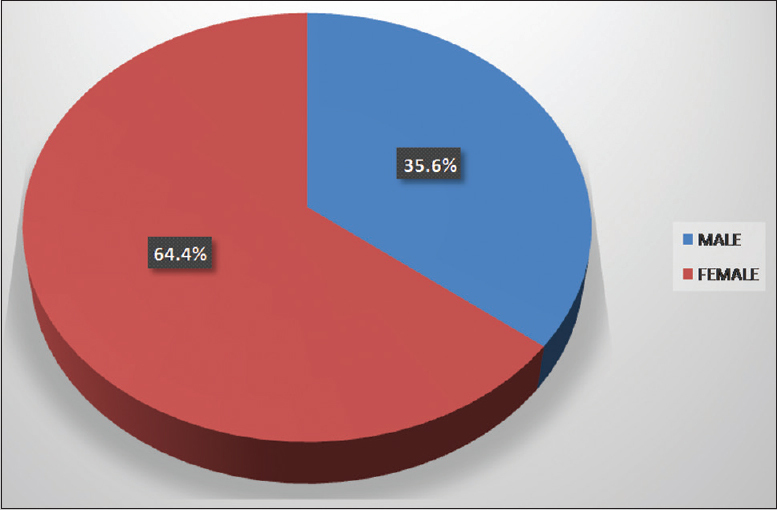 Most of the respondents did not refer the digit sucking child to the dentist for the better management of associated malocclusion. Conclusion: Knowledge and attitude among pediatricians about digit sucking habit in children were found to be unsatisfactory. Continuing dental education programs and symposiums can be conducted for pediatricians to enhance their knowledge about pernicious oral habits. Background: Intelligence is the ability of a mind to acquire knowledge and skills; gain for a fact; to take care of issues; to adjust to new circumstances; and one's ability for rationale, understanding, mindfulness, arranging, and imagination. In a general description, it is a capacity to recognize information and to employ it as knowledge toward a modified behavior within an environment. This thought helps children to maintain oral hygiene in a better way. 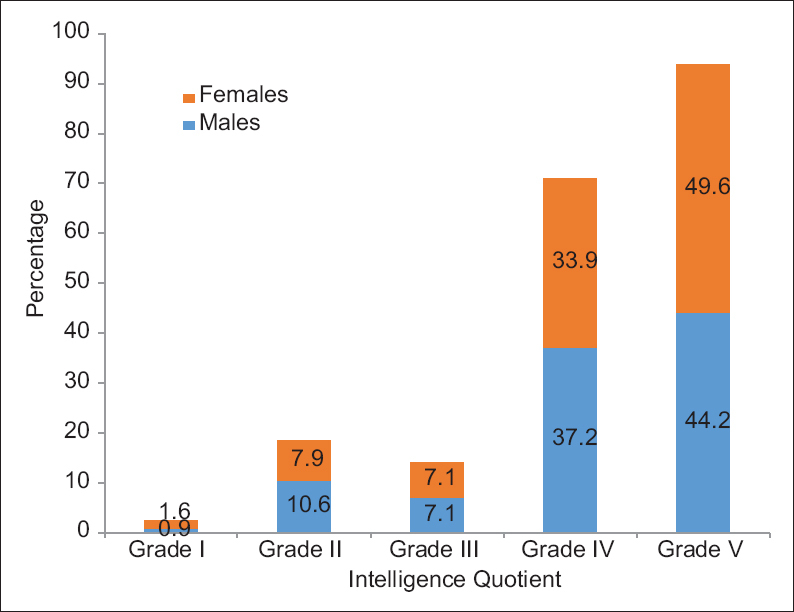 Materials and Methods: The present research was undertaken on 240 schoolgoing children aged 7–11 years of government schools of Hyderabad–Karnataka region, in order to estimate the relation between intelligence quotient (IQ) of a child with dental caries. IQ level has been assessed by using Raven's Colored Progressive Matrices as an IQ testing scale. Caries status was assessed by using Decayed, Missing, and Filled Teeth index. Results: There was no statistical difference between children with different levels of IQ and dental caries. However, the majority of children who belong to Grade V (intellectually impaired) had higher dental caries. Conclusion: An increase in IQ causes a decrease in dental caries and vice versa; however, no significant association was observed between the level of intelligence and caries (P = 0.202). There is a promising correlation between IQ and presence or absence of dental caries among children. Aim: The aim of the present study was to estimate nickel and chromium release from commercially available stainless steel crowns (SSCs) in artificial saliva. Materials and Methods: Ten crowns from three manufacturers were immersed in 10 ml of artificial saliva and stored in separate tubes in an incubator at 37°C for 28 days. The crowns were removed from each tube on every 7th day, and placed in other tubes with fresh artificial saliva. Flame type atomic absorption spectrophotometer was used to check for the release of metal ions in the solution inside each tube at the end of 1, 7, 14, 21, and 28 days and the control samples. Results and Statistical Analysis: Two-way analysis of variance and pairwise comparison using Bonferroni test was used for statistical analysis. 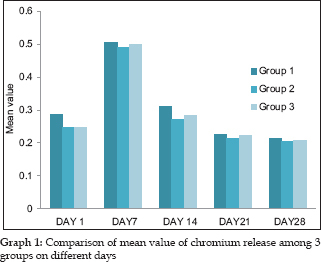 There was statistically verified difference in the release of nickel and chromium on different days in each of the group of SSCs tested. However, no significant difference was seen in the release of both metals among the groups. Conclusion: In all the SSCs tested, there was the release of nickel and chromium, but the total release of both the metals even at a period of 28 days was below the critical level to cause any toxic effects. Hence, the release of metal ions should not be an alarming concern for the use of any of the group of commercially available SSCs. Introduction: Microbes are considered as the primary etiological agents in endodontic diseases. Ways of reducing these agents are root canal debridement and antibacterial filling materials. One of the factors in determining the success of endodontic treatment previously was sealing root canals with materials possessing potent bactericidal effect. Due to cytotoxic reactions of sealers and their inability to eliminate bacteria completely from dentinal tubules, trend to use natural plants extracts have been introduced. 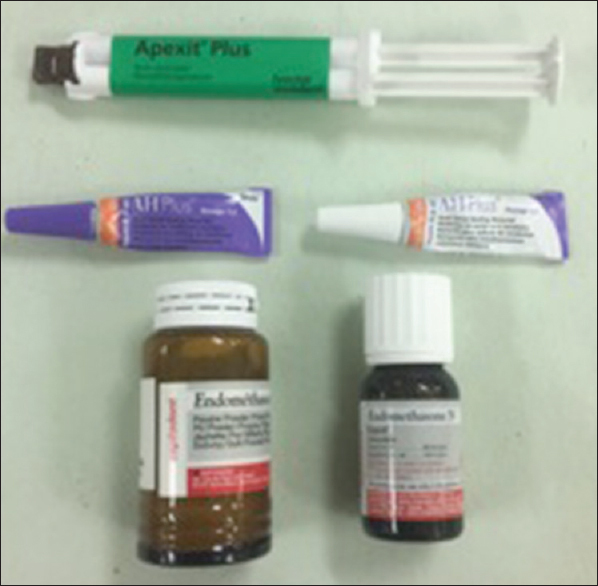 Aim: To compare antimicrobial activity of endodontic sealers added to herbal extracts. Materials and Method: Three sealers mixed with three herbal extracts were evaluated against seven strains of bacteria at various time intervals using Agar Diffusion Test. The mean zones of inhibition were measured. Statistical Analysis: All statistical analysis was performed using the SPSS 15 statistical software version, Chicago. Intergroup comparison was evaluated using Kruskal Walls test along with Mann Whitney U test. The Intragroup comparison was evaluatd using Friedman test along with Wilcoxon test. Results: Statistically significant zones of bacterial growth inhibition were observed largest with Zinc Oxide Eugenol based sealer when mixed with Glycyrrhiza glabra (Licorice) followed in descending order by zinc oxide eugenol based sealer mixed with Tinospora cordifolia (Guduchi) and Mimusops elengi (Bakul) respectively. Conclusion: Zinc Oxide Eugenol based sealer with herbal extracts produced largest inhibitory zones followed in descending order by Resin based sealer and Calcium hydroxide along with three herbal extracts respectively. Context: Dental caries is the most prevalent oral infection affecting the humankind worldwide, and Streptococcus mutans is the major microrganism involved in its pathology. 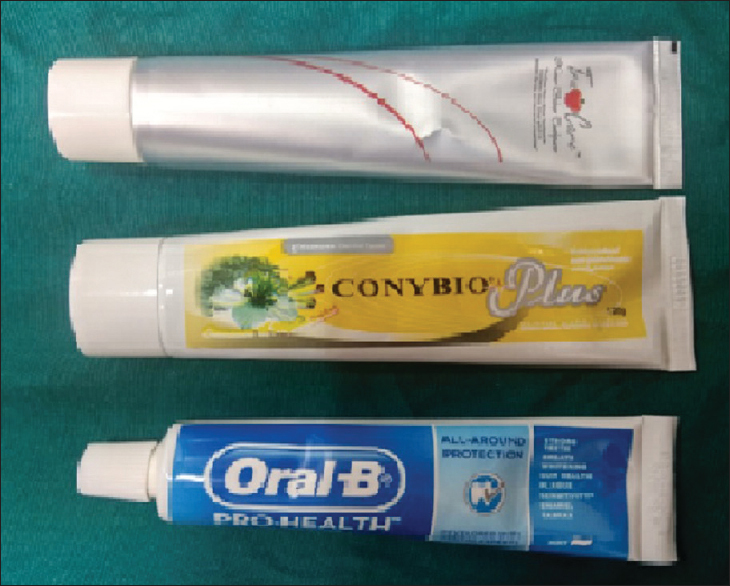 Mechanical plaque control in children is not performed efficiently and thus necessitates the inclusion of certain antimicrobial agents in the toothpaste. Aim: To analyze the antibacterial efficacy of nanosilver, chitosan, and fluoride as an ingredient in the dentifrices against S. mutans strains and comparing them with each other. Subjects and Methods: Pure culture of S. mutans strain (MTCC 890) was obtained from the Institute of Microbial Technology, Chandigarh, India. Nanosilver (Group 1)- and chitosan (Group 2)-containing toothpastes were obtained from the respective dealers, and fluoride (Group 3) toothpaste was obtained from the local market. The antimicrobial activity of the three toothpastes was determined by modified agar well diffusion method. Saline was kept as the control. Statistical Analysis Used: Unpaired t-test was done for intergroup comparisons. Results: Statistically significant differences between Groups 1 and 2, Groups 1 and 3, and Groups 2 and 3 were seen. Conclusions: Nanosilver-containing toothpaste has the highest antibacterial efficacy against S. mutans, followed by fluoride- and chitosan-containing toothpaste. Background: The direct composite veneers follow the concept of no preparation or minimal preparation that has developed an appropriate enamel bonding procedure. The composite veneers can be easily repaired and thus they are economically favorable. The long-term clinical performance of direct composite veneers depends on a number of factors, with fracture resistance and marginal adaptation being one of the significance. Aim and Objective: The aim of the present study was to evaluate the fractural strength and marginal discrepancy of direct composite veneers using four different tooth preparation techniques (window preparation, feather preparation, bevel preparation, and incisal overlap preparation). Settings and Design: The present study is an in vitro study with the sample size of 75 participants. A total of 75 human extracted maxillary central incisors were collected and then divided into four experimental groups and one control group (n = 15 each). Materials and Methods: A total of 75 human extracted maxillary central incisors were collected and then divided into four experimental groups and one control group (n = 15 each). Four tooth preparation techniques were performed followed by direct composite veneering. All the study samples were then splitted into two equal halves. One half of all the samples was subjected to a cell load from 0 N to 100 KN at a crosshead speed of 1 mm at 90° angulation using universal testing machine to evaluate the fractural strength. The other halves were sectioned longitudinally, and the samples were then subjected under the travelling microscope at ×200 magnification to measure the marginal discrepancy at cervical, middle, and incisal locations. Statistical Analysis: The data obtained were subjected to statistical analysis using SPSS Version 20.0. Results: The fractural strength showed the maximum strength in Group V: Control group (273.33 ± 81.01), Group III: Bevel preparation (193.80 ± 66.59), Group IV: Incisal overlap preparation (188.93 ± 76.14), Group II: Feather preparation (160.33 ± 53.59), and least in Group I: Window preparation (147.74 ± 48.95). The marginal discrepancy showed maximum discrepancy in Group IV: Incisal overlap preparation (49.11 ± 6.33), Group II: Feather preparation (48.44 ± 6.01), Group III: Bevel preparation (46.67 ± 7.07), and least in Group I: Window preparation (45.33 ± 6.31). Conclusion: The fractural strength was maximum in Group V, followed by Group III, Group IV, Group II, and the least mean value score was found for the Group I, and the marginal discrepancy was maximum in Group IV, followed by Group II, Group III, and the least mean value score was found for the Group I. Background: Indirect pulp therapy (IPT) is conventional treatment of deep dentinal carious lesions without risk of pulp exposure. Development of new biomaterials with biocompatibility and seal has changed the attitudes toward IPT. Aim/Objectives: This study was conducted to evaluate and compare the clinical and radiographic success of biodentine, 2% chlorhexidine gluconate with resin-modified glass ionomer cement (RMGIC), and calcium hydroxide as indirect pulp-capping materials in primary molars over an observation period of 12 months. 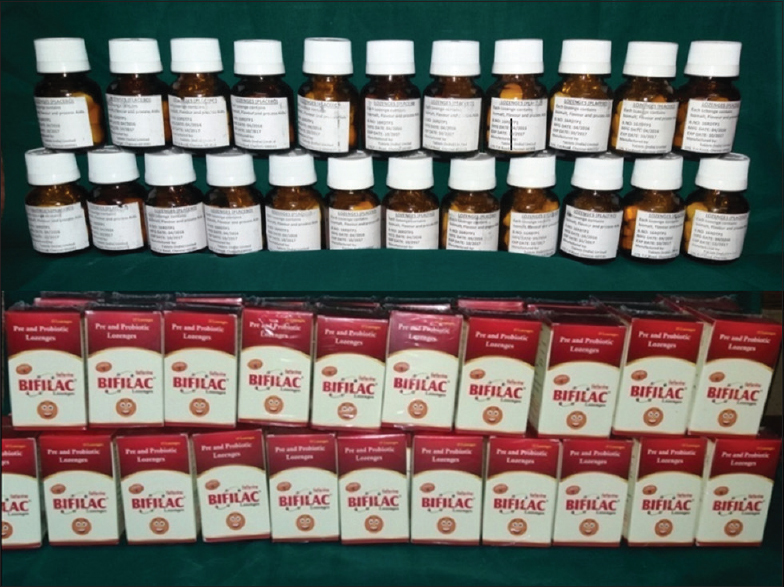 Materials and Methods: A total of 54 primary molars within the age group of 3–9 years, which were indicated for IPT were randomized into three groups of 18 samples each; Group I: biodentine, Group II: 2% chlorhexidine gluconate followed by RMGIC, Group III: calcium hydroxide (Dycal). These cases were followed up for evaluation clinically and radiographically at 3, 6, and 12 months. The recorded data were subjected to statistical analysis using Chi-square test. Results: After 12 months, the clinical and radiographic success of biodentine group was 100% (18/18), with 2% chlorhexidine gluconate disinfecting solution followed by RMGIC was 94.4% (17/18) and calcium hydroxide (Dycal) was 94.4% (17/18), failures included one at 3 months with RMGIC and another at 12 months with calcium hydroxide group; but there was no statistically significant difference observed between them with P = 0.361 at 3 months and P = 0.371 at 12 months interval. Conclusion: Biodentine can be effectively used as indirect pulp-capping medicament in primary teeth which has similar clinical and radiographic success as 2% chlorhexidine gluconate in conjunction with RMGIC and calcium hydroxide. Aim: The aim of this study is to assess the variations in the levels of Streptococcus mutans in saliva before and after short-term daily intake of the probiotic lozenge. To estimate the prevalence of S. mutans serotypes e, f, and k and its variations in salivary levels before and after short-term daily intake of the probiotic lozenge. Materials and Methods: This double-blind randomized controlled trial was conducted among 60 children of 6–12 years old, who were given lozenge twice daily containing probiotic bacteria twice daily, one in the morning and another in the evening after brushing for 1 month. The placebo lozenge group also followed the same protocol. A pre- and post-quantitative analysis of S. mutans and serotypes e, f, and k level were done in the saliva of both experiment and control groups. Statistical Analysis: The data thus collected were statistically evaluated using repeated measures of ANOVA, followed by post hoc test and independent t-test. Results and Conclusion: When compared with baseline, a significant reduction of S. mutans was seen after 1 month intervention and 6 months follow-up. The prevalence of serotype e was found to be 5% and serotype k was found to be 12%, whereas none of the samples carried serotype f. Future long-term research with a larger sample size is required to determine the prevalence of S. mutans serotype and longer evaluation period is required to assess the preventive role against caries development. Introduction: Pulpectomy has been a treatment of choice in all necrotic primary teeth. Advancing technology has brought the rotary system to reduce the manual dexterity and improve the quality of treatment for pulpectomy. Advancing technology in pediatric dentistry should be used for the better treatment protocol. Aim: The aim of this study is to compare the obturation quality and instrumentation time after root canal instrumentation with rotary Kedo-S files, hand K-files, and H-files in primary molars. 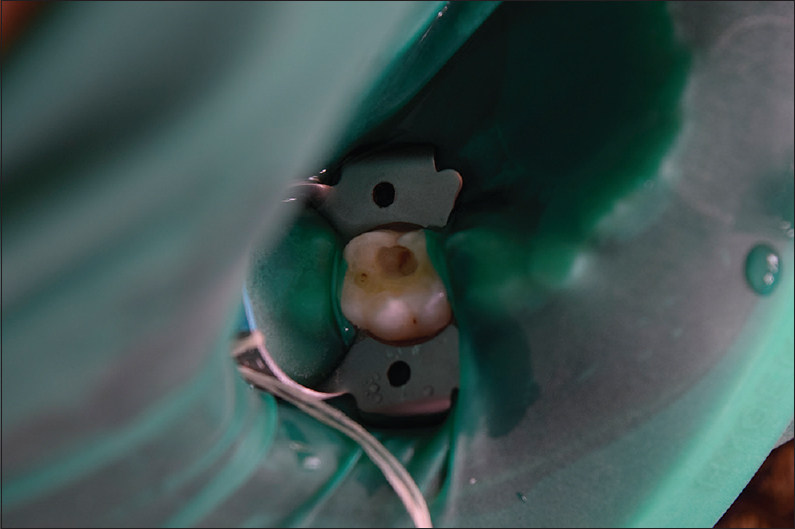 Materials and Methods: A randomized control trial where pulpectomy was performed on 75 primary molars equally distributed for instrumentation with K-file, H-files rotary Kedo-S files, respectively. The instrumentation time and obturation quality were noted. 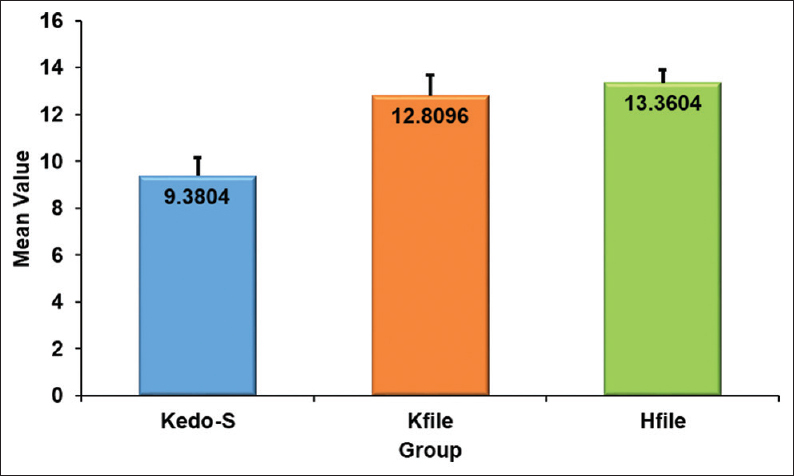 Results: Kedo-S files showed the least instrumentation time with better obturation quality as compared to other two groups (P < 0.001). Conclusion: Pediatric rotary files Kedo-S has better obturation quality in minimum instrumentation time. Objective: Pediatric endodontics has witnessed many advances in recent years, thus facilitating a faster and efficient treatment option in root canal therapy in children. 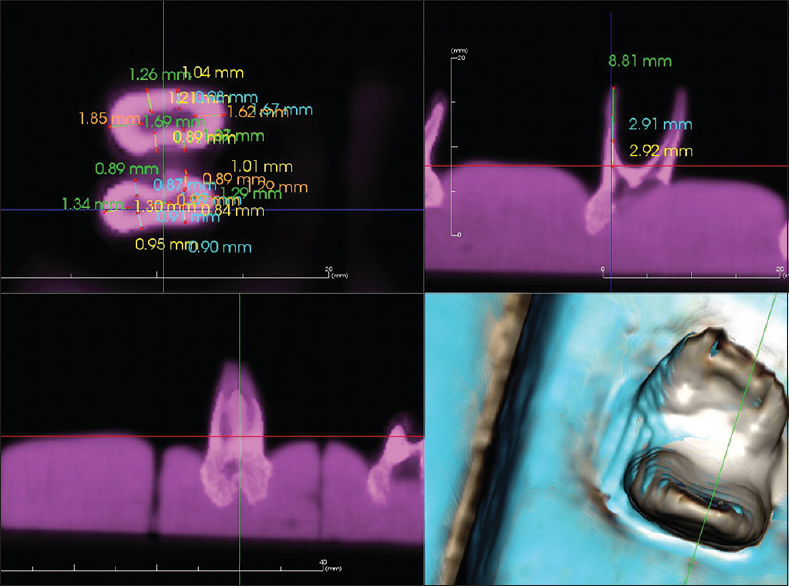 This in vitro evaluation aims to determine the amount of dentin removal in primary mandibular first and second molars instrumented with hand and rotary files using cone-beam computed tomography (CBCT). Materials and Method: Sixty primary mandibular molars were divided into two groups: Group I was prepared by manual instrumentation using K-type files and Group II was prepared with rotary instrumentation using 0.04 Hero Shaper Classics. 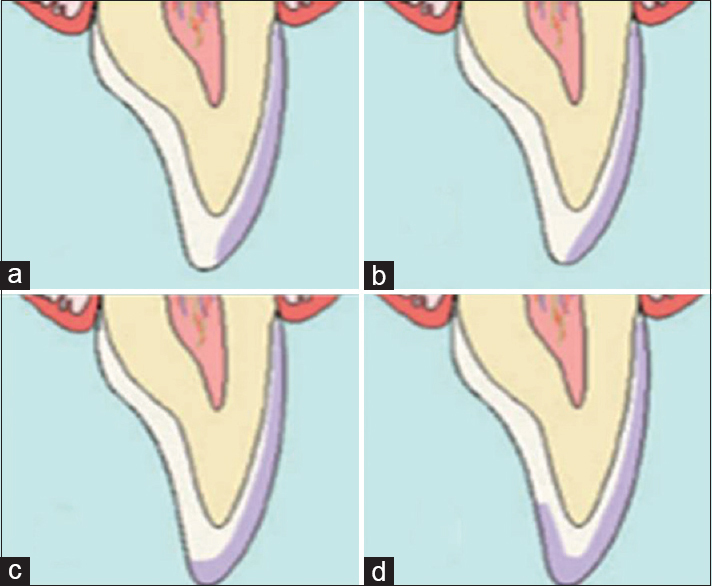 Both these groups were further divided into two subgroups, namely (a) primary mandibular first molar and (b) primary mandibular second molar. All the root canals were prepared up to size 30 using the stepback technique. They were mounted on silicone-based impression material and subjected to CBCT scans for the evaluation of dentin removal before and after instrumentation. Dentin removal was calculated by superimposing images using the InVivo 5.1 Anatomage software. Data were statistically analyzed using independent samples t- test. Results: An average amount of dentin removed was found to be significantly higher in manual instrumentation compared to rotary instrumentation in both primary mandibular first and second molars (P < 0.001). Conclusions: Rotary technique serves as an efficient alternative to the traditional manual instrumentation by overcoming its shortcomings in terms of conservation of the remaining dentin thickness and the time required for its preparation. Background: The current concepts of dental caries focus on cariogenic bacteria such as Streptococcus mutans fermenting carbohydrates to form organic acids, which cause a drop in pH, resulting in demineralization of the tooth surface. [l] Studies show that Tulsi has broad-spectrum antimicrobial activity. Hence, this study aimed at estimating the change in salivary pH and viability of S. mutans on chewing of Tulsi leaves, in children. Aims: This study aimed to estimate the change in salivary pH and viability of S. mutans on chewing of Tulsi leaves. Materials and Methods: The study was carried out on thirty children aged 9–12 years. Oral prophylaxis was performed prior to sample collection. Three samples were collected per child, one before and two after chewing of Tulsi leaves. The change in salivary pH and viability of S. mutans was assessed. Statistical Analysis: The obtained data were analyzed using Friedman test and Wilcoxon's test. The level of significance was set at P < 0.05. Results: The results obtained showed no significant difference in the pH values obtained from the samples, but there was a significant difference in the S. mutans' colony counts. Conclusion: Based on the results obtained from this study, it may be concluded that Tulsi (Ocimum sanctum) has the potential to be developed into an antimicrobial agent against cariogenic bacteria, specifically S. mutans. Context: Pits and fissures of teeth have been recognized as the most susceptible areas for initiation of caries. The ability of the resin sealant to thoroughly fill pits, fissures, and/or morphological defects and remain completely intact and bonded to enamel surface is the primary basis for its caries prevention. Aim: The present study evaluated and compared the retention rates and development of caries in permanent molars of children sealed with amorphous calcium phosphate-containing (Aegis™) and moisture-tolerant fluoride-releasing (Embrace WetBond™) sealant over a period of 1 year. Settings and Design: This was a double-blind, split-mouth, randomized controlled trial among children aged 6–9 years. Methods: Sixty-eight permanent mandibular first molars in 34 children were randomly assigned to be sealed with Aegis™ or Embrace Wetbond™ sealant. The follow-up examinations were conducted at 3, 6, and 12 months for evaluating the retention and development of caries. Statistical Analysis: SPSS version 16.0 was used for the analysis. 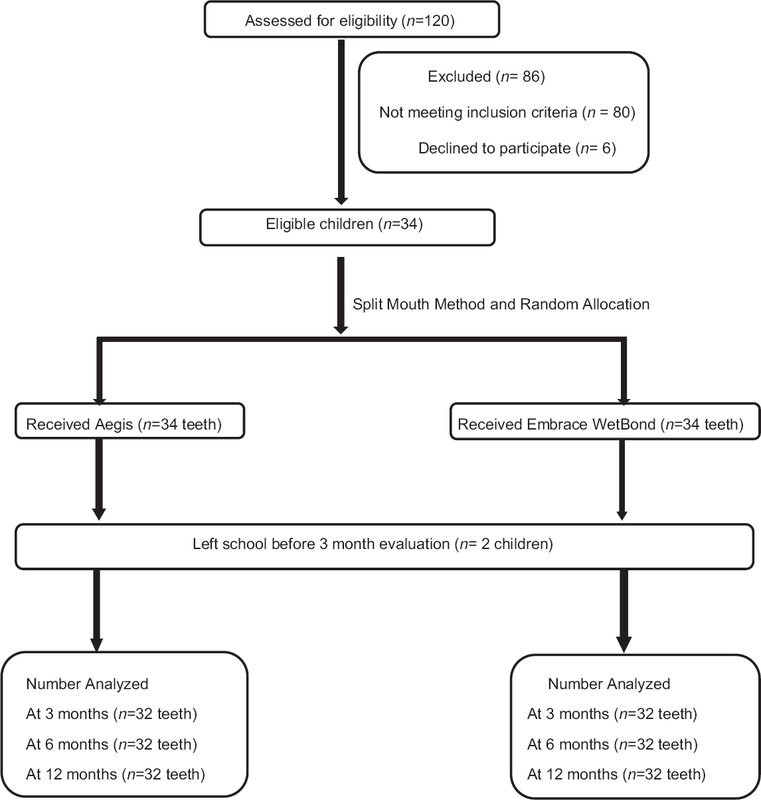 Within-group comparison of retention and development of caries at 3, 6, and 12 months was evaluated using the Friedman's test. Results: The final sample was 32 children with 64 teeth. At 12 months, 23 of 32 (72%) sealants were completely retained in Aegis™, whereas 21 of 32 (65.6%) were retained in Embrace Wetbond™ group. 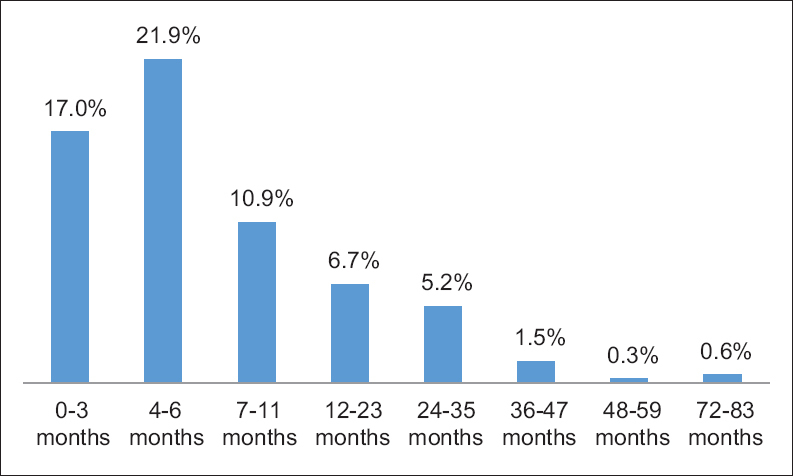 There was no significant difference in the retention rates of Aegis™ and Embrace Wetbond™ sealants at 12 months (P > 0.05). Conclusion: Aegis™ was superior to Embrace Wetbond™ sealant as Aegis™ exhibited higher retention and lower caries scores. Tooth avulsion is a severe form of luxation injury that involves damage to both the pulp and the periodontal ligament. Avulsed teeth need to be replanted immediately in order to restore esthetics and function. Delayed replantation often results in ankylosis of the tooth which is a common sequela following avulsion injuries. An ankylosed tooth with a necrotic periodontal membrane does not move along with a growing alveolus leading to an arrest in height and width of the alveolar bone causing the tooth to be infraoccluded in a growing individual. 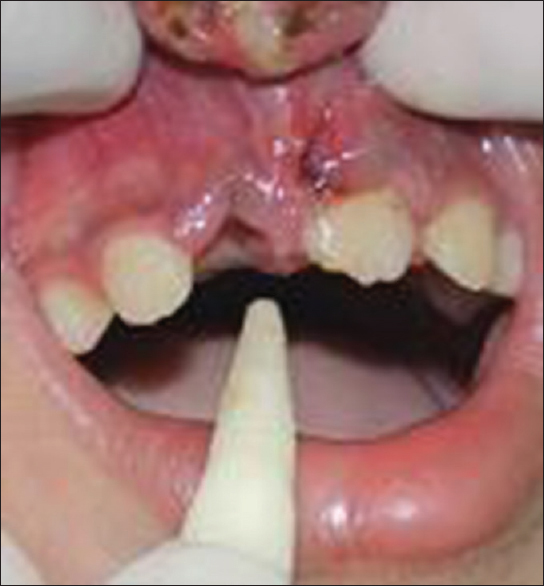 This case report describes the multidisciplinary treatment and long-term management of an avulsed permanent central incisor in an 8-year-old child with delayed replantation. Teeth which erupt in the 1st month of postnatal life are known as “neonatal tooth.” The incidence of these teeth ranges from 1:2000 to 1:3500 live births. Natal teeth are more common in mandibular central incisor region, followed by maxillary incisor region and mandibular canine region. The neonatal or natal teeth in the maxillary molar region are a rare occurrence. 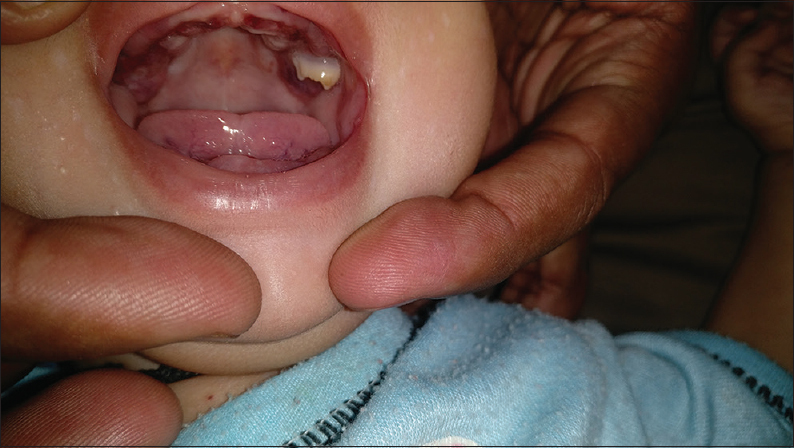 This article represents a rare case of the neonatal tooth with Langerhans cell histiocytosis.